The significance of social media is hardly debatable, emerging as a field of inquiry within a wide variety of social science literatures on topics ranging from revolution theory (see Noam Chomsky’s Occupy) to parenting (see Jodi Gold’s Screen-Smart Parenting). Recent ‘online-coordinated’ rebellions from the Occupy movement to the Arab Spring have further highlighted the significance of social media in political life. Its significance in personal life is evident – the fact that I wrote this for the LSE Review of Books blog and that you are reading it on your PC/laptop/mobileapp speaks for itself. However, the relationship between the ‘political’ and the ‘personal’ dimensions of social media remains undertheorised. 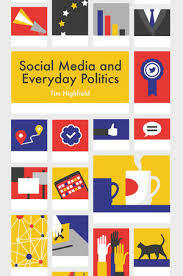 Tim Highfield’s book, Social Media and Everyday Politics, aims to address this literature gap. Through studying the coverage of key events – including political campaigns, elections, riots and crises, but also less clearly political events such as the Eurovision Song Contest and celebrity scandals – on a wide variety of social media (blogging platforms, social networks, content-sharing sites and apps, forums and online communities) over a six-year period between 2009-15, the book demonstrates how the ‘so-called real [political] life necessarily bleeds into online life; and vice versa’. Highlighting how even the most seemingly mundane online activities can be raced, classed, gendered or politicised in one way or another, Highfield contests the existing literature’s overemphasis on major political events at the expense of ‘normal, everyday topics’ on social media. His research responds to this gap through examining ‘the extensive ways in which the political and the personal, the formal and the informal, the everyday and the extraordinary, are intertwined on social media’. Stemming from this nexus point, the author argues for a balanced approach to social media studies. Social media is indeed an innovative platform for political contestation, he argues, but it does not, on its own, create new political realities. Political reality is still produced through similar ideological, discursive and material dialectics that take place on online and offline platforms, wherein neither are separable from the other. Social media does not necessarily revolutionise the modes of those dialectics, but it does indeed put forth a new technology of contestation through which those dialectics are extended. This technology, however, is not entirely passive. Its algorithms affect which topics, events, issues, debates and narratives are most popularised. Although those ‘algorithms are in part guided by past […] behaviours and choices’, they do reinforce, mainly through this path-dependant mechanism, particular (raced, classed, gendered) behavioural codes. There are also other rules beyond technical algorithms that govern social media dialectics. Humour, visibility, transferability, activity, language and social appropriateness are a few examples from the long list of factors which, as Highfield demonstrates, give prominence to one narrative over others on social media. Combined, these factors determine the power distribution in the new society of ‘gate-keepers’ and ‘influencers’ that social media introduces. This society, Highfield argues, is different from ‘traditional media’ society on three main levels. First, it has a wider base of authors and gatekeepers. Almost everyone has the power to post their opinion and share those of others. Second, it addresses ‘active’ audiences. The classical distinction between the ‘sender’ and the ‘receiver’ in traditional mass communication is abandoned on social media. Instead the message ‘receiver’ simultaneously plays a ‘sender’ role through sharing, framing and reproducing the message. Those two differences, however, are mitigated by the variation of power (in this case counted in terms of ‘followers’) between one user (the sender/receiver) and another. Thus, social media, like all other media outlets, still has its opinion leaders and its relatively passive ‘followers’. The third difference, however, persists and marks the book’s main argument: social media transforms the personal/political dichotomy which characterises traditional media discussions. The new prospect of turning a personal opinion, narrative or anecdote into a ‘public’ debate by the use of a simple ‘share’ button and, conversely, of ‘personalising’ public issues and events around individual experiences and interests through the same means is indeed transformative of traditional media-society interactions. Certainly, the interaction between the ‘personal’ and the ‘political’ is not solely pertinent to social media. Plenty of our everyday activities are politicised without us even noticing. As Highfield puts it, ‘we socially mediate our lives’. This social mediation had always been extant, and has been multiplied with the invention of new mass media platforms like print, radio and television. Social media, however, is not just ‘another invention’. Its qualitative difference from other media makes its effects more revolutionary. Highfield highlights two of those qualitative differences. Firstly, its instant availability. The ‘ubiquity of access to mechanisms for capturing, posting, sharing and responding to content instantly and everywhere means that everyday practices around social media are always-on and always-here’. If traditional media writes ‘the first draft of history’, social media writes ‘the first draft of the present’, not only because of its immediate transfer of news, but also because of its instantaneous updating and reframing of, as well as its response to, such news. In this sense, social media does not only ‘transmit’ news promptly, but also comes to ‘politicize’, ‘personalise’ and eventually ‘reconstruct’ it with equal promptness. Secondly, its minimal, if any, barriers to entry. Social media’s ‘escape’ from confining glass ceilings and the censorship imposed by governments and corporates who control traditional media opens up an opportunity for emancipation. This opportunity, however, is mitigated by the equal opportunity for regressive, fascist and discriminatory narratives, discourses and even harassments, threats and abuse ‘using the same [entry-barrier free] channels’. This leaves the repercussions of such a waiver of traditional media’s ‘barriers to entry’ undetermined. Yet, the relative ease in politicising personal matters and personalising political matters, instigated by social media’s lack of major entry barriers, remains a critical transformation brought by social media to everyday politics. Would such a barrier-free (virtual) society lead to more freedom of thought or greater coercion, bullying and discrimination? How will it protect personal property (authorship, pictures, etc) and punish deviance? How will it define knowledge and verify information? What will determine the modes of its knowledge production, hierarchisation and dialectic contestation? These are all questions that are spurred by Highfield’s analysis, awaiting future research. On his part, Highfield drafts a tentative account of the main transformations that this innovation has brought about. This can be summarised as follows: the abandonment of sender/receiver and political/personal dichotomies; the waiver of traditional barriers to entry; the ubiquity of authors, messages and gatekeepers; and the automated (algorithms-driven) path-dependency of communicated messages and popularised topics. But those findings, as aforementioned, leave the reader with more questions than answers. The book’s main contribution thus lies in the questions it draws attention to rather than the admittedly tentative conclusions it suggests. In a nutshell, Social Media and Everyday Politics contests two contrasting approaches to social media research: the one that valorises its political significance and the other that treats it as an entirely personal space. Instead, Highfield conceptualises social media as a technological innovation that fosters interactions between personal and political lives. The implications of such fostered interaction remain unascertained. Highfield’s mapping of social media’s transformative effects is thus not entirely conclusive; but it is a useful point of departure for future research. As such, the book informs not only media and technology literatures, but also sociological and anthropological studies of the postmodern society that is socially mediated by this transforming invention called ‘social media’. Hesham Shafick is a PhD candidate at Queen Mary, University of London (QMUL). Supervised by Kimberly Hutchings, his dissertation studies the genealogy of political violence against Islamists in Egypt. He previously studied at University College London, Washington College, University of California in Los Angeles and the American University in Cairo. He has also taught at the British University in Egypt.